Our Structural Engineering Software Module includes a comprehensive range of utilities in both 2D or 3D. 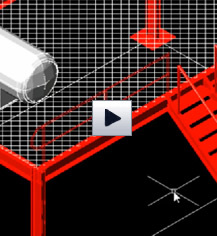 Have a look at our recent video which walks you through how to create steel beams in 3D. Mech-Q’s Steel Shapes types available are AISC, BHP, CISC, DIN, RSA, JIS, IS, and more. The Structural Software Module i supports with several CAD packages including: AutoCAD, IntelliCAD and BricsCAD. It also supports both Metric & English (U.S. / Imperial) Units.